I have been thus compelled to create a thread dedicated to the compilation of regiments, techniques, factors and proven aids with the goal of cleansing and optimizing the functionality of the pineal gland/third eye/ajna through methods which detoxify it (the supplementary result and necessity are its decalcification and removal of accumulated fluoride) and stimulate or charge it. To third eyes which have not been awakened, the intention is that following of the regiment presented will be to awaken it, and to those who enjoy the benefits of an already open ajna will experience enhancement of its capabilities and propensity to facilitate divine connection and generation and perhaps discovery of new ones. Gotu Kola: The tea, extracts, and encapsulated whole herb of Gotu Kola is known to be a potent detoxifier and stimulator of the pineal gland and overall beneficial to the entire brain. I report tremendous success with it and noticeable enhancements in clarity, lucidity and intuition since taking it. Wood Betany: I have not personally taken it but have seen it always mentioned alongside Gotu Kola in regards to detoxification and stimulation of the pineal. Sandalwood: The essential oil of Sandalwood is known to oxygenate the limbic area of the brain and most notably the pineal gland, allowing better blood flow to it, also being high in sesquiterpenes, vigorously stimulating it. Its administration is best done dermally via application beneath the nostrils to allow inhalation and the area of the forehead where the pineal is located. In my experience, sandalwood has been highly effective and beneficial. Frankincense: Again, not something I hold personal experience in using but is always mentioned alongside Sandalwood for the same reasons and as having similar mechanisms. The reason for the high effectiveness of essential oils, especially those geared towards stimulation of the pineal gland, are known to be because of their unique ability to penetrate cell membranes, swift travelling throughout the body, decrease of the thickness of blood to enhance circulation, the increase of atmospheric oxygen and providing of negative ions, and most relevantly the stimulation of secretion of nerotransmitters, endorphins, hormones, and enzymes. Dimethyltryptamine: Perhaps the most important endogenous neurotransmitter to exist, holding the function of regulation and sustenance of all states of consciousness awareness including waking states, dream states, and mystical states. It is theoretically produced in high amounts during birth, the transition of death/near death experiences, the transition to dream states and in trace amounts during deeper states of meditation. While many are skeptical of the claims that it is produced in the pineal gland those who hold actual experience with it report a viscerally intense pressure surrounding the area of the pineal following usage via the smoked route of administration. While its availability is uncommon and possession deemed illegal by those negatively oriented authoritative groups that find enjoyment and believe the necessity in suppression of the natural abilities, freedom and divine connection of the masses, it is perhaps the most immediate and potent of supplements geared towards complete cleansing and stimulation of the pineal gland. It holds also the ability which no other aid listed above has of accessing and activating the various innate capabilities and functions of the pineal gland in extremely powerful degrees that cannot in any capacity be consciously accessed without the overloading of the pineal with this neurotransmitter, its possible functions including but not limited to extreme extradimensional perception and assorted macrocosmic experiences. The functions I listed however are most directly and immediately accessed from the smoked route of administration albeit the most optimal utilization is in conjunction with the ingestion of a monoamine oxidiser inhibiter or MAOI an hour prior to smoking, most commonly used sources being the seeds of Syrian Rue or the vine of Baanisteriopsis Caapi, in order to alter the experience from a brief and uncontrolled ‘flash’ of apparent visions and transcendent experience to an hours time of exploration of the dimensional region and abilities afforded which may translate to an eon or so of time in that state. Oral ingestion via the form of the sacramental medicine brew Ayahuasca, being the most traditional method used by indigenous cultures for millenia, takes on a much more grounded and spiritually cleansing nature. It is purgative, visionary albeit Earth-bound, powerful in its transmission of data/plant gnosis, and may be used to “charge” the powers of the imbiber. Phenomenon precursory of the 4th Density may be experienced, examples being that of the sharing of a group mind in a group Ayahuasca session (i.e. telepathy) or the possible creation and usage of projectiles of energy against another, although the latter example is included as a result of my personal and slight mischievously-influenced musing. 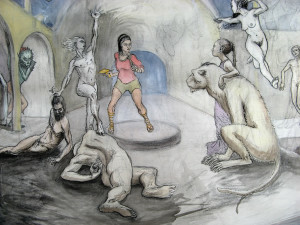 Interesting to note is the depiction of UFO’s in several Ayahuasca vision paintings and the relaying of experiences where extraterrestrial contact occurs with natives in the period following Ayahuascic alteration, almost implying that the energetic empowerment and increased vibratory shift was sensed by and enabled direct contact with a higher dimensional sentient being. Be aware that the utmost of respect, responsibility and purity of intent must be held when approaching the experience. Recreational usage and highly frequent usage of DMT in any route of administration is considered abuse, misuse and an overall waste of potential growth, attainable benefit and knowledge, and is highly discouraged. It is entirely possible to become “locked out” of the experience if irresponsibility in ones usage manifests or due to lack of direction and purpose in using this technology. Irresponsible or aimless usage is a waste also considering its rarity, especially for those whose living situations bars them personal extraction which is high yielding and possible, as there exist numerous extraction methods/teks available on the internet. My small handful of solo Ayahuasca experiences and my several dozen smoked DMT experiences have proven it to be extremely effective in the goal of pineal optimization and ascertainment of direct esoteric gnosis, although I have had to resort to and settle with more natural methods for the past few months given its uncommon availability. Meditation: The most simple, basic, easily available, unlimited in utilization, easily performed and highly beneficial of methods is meditation where one’s focus is fixated in the area directly above and between one eyes where the third eye is located. I am going to cite a member of our community for it was his informative compiling of information which scientifically and biologically explains the process of stimulation of the pineal through meditation. A huge round of applause to Tenet Nosce is in order. (05-21-2012 08:44 PM)Tenet Nosce Wrote: I went back to the basic anatomy, and looked at the neurological input to the pineal gland. I found there are four neural ganglia (kind of like mini-brains or relay stations) that feed into the pineal gland. Turns out each of them is activated by a different behavior or activity that is associated with meditative practices. One of them is located near the top of the cervical spine, right at the point where the neck flexes and extends when one is nodding. Thus, its activity is modulated by the specific angle at which the head rests upon the spine. Turns out the ideal angle is achieved by sitting with the spine fully erect, and the head positioned about 10-15 degrees below a line parallel with the ground. Just as the yogis recommend. A second ganglion is stretched across a little plateau of bone in the inner ear, and responds to vibration, such as is generated by chanting, toning, hitting a gong, or ringing a bell or one of those Tibetan bowls. A third one is related to the olfactory nerve, which translates our sense of smell as well as the sensation of air moving through the nasal cavity. Thus it is activated by the lighting of incense, and focusing one’s awareness on the tip of the nose where the air is moving in and out. Another nerve from this ganglion drops down through the head and emerges right at the point where the hard palate meets the soft palate- exactly where yogis advise to place the tongue during meditative practice. The fourth one is related to our perception of light and motion. Turns out that the perfect way to activate this one is to focus one’s gaze at a flickering candlelight in an otherwise dim room… again just as the yogis recommend! I am a doctor, so having a better idea what the technical jargon means makes the process easier. But- one doesn’t need any special resources other than the Internet. All I did was nose around on the net until I found a page which described the nervous input into the pineal gland. Then, I looked up the nerves themselves to see what physical pathways they traverse in the body. Then I looked up the ganglia, or relay stations, to see what kind of information was being passed through there. It was then I realized that each one carries information generated by a different behavior associated with meditation. The challenge with doing this kind of research is more due to having to pull bits and pieces from various sources, as no single source puts them all together. There are so many things like this out there, that I have to admit the most rational explanation I can come up with is that there actually are people out there somewhere with a clear intention to draw people’s attention away from certain ideas, and have enough control of the media sources to pull it off. I’ve trained my mind to look for the information that is limited or missing. Whether it’s a news report or a textbook- a part of my mind is looking closely at the boundaries of the information offered, and noticing if there are any gaps or holes. I find them all the time, and they tend to lead to fascinating places. The information he has presented has helped me make sense in why is it that certain aids I’ve long used have been of tremendous assistance especially in my constant exposure to the 432hz tone frequency when I meditate and my inhalation of pineal-stimulating essential oils right beneath my nostrils and explains also why the erection of the spine and the tilting of one’s head are considered crucial for proper posture in meditation. Given that the information he presented was initially disconnected and it was him that took the effort to connect the dots, the content is original, comprehensive and is significant enough to be presented in a thread geared towards the information I wish to compile here. Once again, thank you Tenet Nosce! Magnetic Stimulation: I have heard anecdotes which reference the supposed ability of extreme stimulation to the point of powerful psychic receptivity, phenomenon and awareness by applying the north or + side of a magnet to the area of the forehead where the pineal is located for a fair period of time each day for weeks at a time, although I have not experimented with this (yet) and thus cannot presently vouch for its validity or possible effectiveness. If anybody has experience and success with it, it would be much appreciated if you may be able to verify this claim. Avoidance of fluoride: The primary cause of retardation of capability, inhibition of psychic prowess and skewering of divine connection is poisoning via the predominate culprit, fluoride. It is highly suggested to completely avoid fluoride, although if this is circumstantially impossible, diminish exposure to it as much as possible. It is added to most water sources and widely available as the active ingredient of most toothpastes. Following the above regiment will already guarantee that the detrimental effects of fluoride will be reversed and healed, and while the regiment is implemented exposure to fluoride will not be as effective in debilitation as it should be, but regardless it is still suggested to avoid it as much as possible, especially if no pineal detoxing regiment is being followed. Fermented Skate Fish Liver Oil/Cod Fish Liver Oil: Testimonials show that its usage can result in decalcification of the pineal gland and for having extreme success in doing so, credit to Oceania for bringing this up. Sungazing: The practice of sungazing, most notably before and shortly following sunrise although one may direct their pineal towards the sun without directly looking at it throughout the day, results in the energetic nourishment of not only the pineal gland but one’s entire field of energy. It has been reported also that endocrine secretions occur during the period of sungazing.